We are an independent landlord with a growing portfolio of good-quality housing in the south-east Birmingham and Solihull area. Our philosophy is to provide attractive and comfortable homes at competitive rents and look after our tenants well, building an atmosphere of mutual respect which makes our tenants want to remain with us for a long time. "It has been a pleasure living at your property and we do appreciate the opportunity and say a big thank you." - Dammy & Shola, June 2014, moving on after 4 years with us. You can see more reviews from our tenants here. high-quality accommodation for individual professionals who prefer to rent a room in a conveniently-located, fully-furnished shared house (known as an HMO, or House in Multiple Occupancy) where the rent is inclusive of all bills and cleaning of the communal areas. 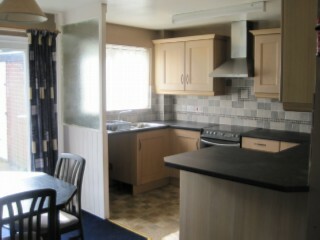 The kitchen, dining and lounge areas are shared and there is a mixture of shared and ensuite shower rooms. This arrangement works out significantly cheaper than renting a self-contained flat and offers a great way to establish a social life if you're new to the area. We are careful to meet our legal obligations as landlords: we are registered with the Deposit Protection Scheme, and have appropriate landlord's buildings insurance and, where a property is not owned outright, the lender's permission to let. All our properties have the required Gas Safe certification and have been checked for electrical safety. In addition, we are members of the Guild of Residential Landlords and the National Landlords' Association, and are accredited under the Midlands Landlord Accreditation Scheme (accreditation no. 2288) and the Private Rented Sector Accreditation Scheme. We are quick to respond to tenants' needs and do our utmost to fix any problems as soon as possible (provided that the issues are not the tenant's responsibility). All prospective tenants are referenced and most are required to provide a home-owning guarantor who will also be referenced, with the tenants being asked to pay a low administration fee towards the cost of these checks. We normally charge £50 for up to two people named on the tenancy agreement, plus another £20 per additional named tenant, with no additional charges for us to check guarantors as well. (We require all adults living at the property to be named on the tenancy agreement.) We also like to visit you in your current home wherever possible. We are registered with Tenant Referencing UK (formerly the Landlord Referencing Service) in order to help us avoid tenants who have caused problems for previous landlords. Like most residential landlords we use Assured Shorthold Tenancies (ASTs), normally for six months, but if we and the tenant are both happy with the arrangement then the agreement will automatically become a Periodic Tenancy at the end of the term. Alternatively, if the tenant requests it then we are happy to grant another AST, of either six or twelve months' duration. We normally take a deposit equivalent to approximately 6 weeks' rent. We do not levy any charges for inventory, tenancy agreement, AST renewal, etc - the only money we require you to hand over is the initial application fee, the deposit (which a good tenant will normally receive back at the end of the tenancy) and the monthly rent. Compare this with admin fees of £200+ typically charged by letting agents! For a single let we will carry out a property inspection within the first 2-3 months, another around the 6-month mark, and thereafter normally at intervals of 6 months. In an HMO the communal areas are serviced on a weekly or fortnightly basis and we generally carry out room inspections every 2-3 months. These inspections are for us to identify any maintenance that needs doing as well as to check that the property is being looked after by the tenant. We may accept pets in some single-let properties, subject to them also passing appropriate checks and a total deposit of (typically) two months' rent being placed - though the exact amount will depend on the pet and the property. A fixed cleaning fee will normally also be charged upfront, to cover a full professional clean and de-flea at the end of any tenancy where pets have been kept. A purchase price is agreed which is valid for a fixed period of time - typically 3 years - and the tenant has the option to buy the house at the agreed price at any time during that period, provided that the terms of the tenancy are not breached. If house prices go up before the purchase is completed then the buyer benefits from the increase in value. An agreement can be made for longer, in which case the buyer will be required to pay a proportion of any uplift in value above the agreed price after the initial fixed-price period - so they will still benefit from part of the increase in value. For example, suppose that a 5-year option is agreed with a purchase price of £100,000 for the first 3 years and 60% of any uplift payable after that. If the tenant exercises their option to buy just before the 3 years are up then they pay £100,000, regardless of what property prices have done in the meantime. If they buy at the end of the 5 years and the value has gone up to £150,000 then the buyer pays £130,000. The tenant pays a non-refundable option fee (typically around 1-2% of the agreed purchase price) in return for the option to buy, and a legal agreement is drawn up. Provided that tenant adheres to their side of the agreement, the landlord cannot sell the house to anyone else during the option period. The tenant then pays market rent to the landlord, and can treat the house as their own, taking over responsibility for most aspects of its maintenance and with the freedom to redecorate and improve as any homeowner would (subject to the landlord's agreement and any regulatory requirements). As well as paying rent, the tenant will need to save money up towards the deposit. For example, if the tenant wants to put down a 15% deposit on an agreed purchase price of £100,000 in three years' time (which would mean taking out a mortgage at 85% loan-to-value) then each month they'll need to put aside £15,000 &div; 36 months = £417 per month. The tenant will also need to make sure that they get their credit record into good enough shape to able to raise finance in order to complete the purchase. For someone who's had significant debt problems in the past, this is likely to take around 5 years of "clean living". 3. By mutual agreement, the purchase price may be renegotiated, a new option fee paid and the agreement extended. If you're struggling to save up a deposit or need some time to improve your credit record before applying for a mortgage then a rent-to-buy agreement can give you the chance to do this and put down roots at the same time. But what's in it for the landlord, you may wonder? Well, a house that makes a good family home doesn't always generate very good rental income relative to its value, so this can be a way of freeing up funds to invest elsewhere without having the expense and security risk of an empty house while waiting for it to sell. For a vendor who has a house that they don't need to sell immediately and don't want to dispose of too cheaply, this is a way for them to get a fair price with rent coming in to cover their costs until the sale goes through. Until the sale completes, the landlord has good tenants who look after the property well and intend to stay there long-term, practically eliminating the costs of maintenance and voids and so maximising the rental income in the meantime.